I recently wrapped up reading a fantastic novel written by Howard McEwen, a freelance writer from the Cincinnati area. Wrath - the life and assassination of a United States Governor dealt with the life and machinations of the only sitting governor in United States history to suffer at the hands of an assassin's bullet. The journey of William Goebel was a difficult one. Born in Pennsylvania, Goebel became for a few years the "man of the house" while his father served in Lincoln's army. Debt-ridden before his enlistment and still financially suffering after his service, Goebel's father took his family down river to Cincinnati. The family was deposited at the cheaper port across the river: Covington, Ky. 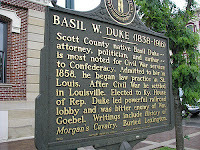 It was from this Kenton County city that William Goebel learned to hate Confederate veterans and sympathizers, the railroads, and a host of others. 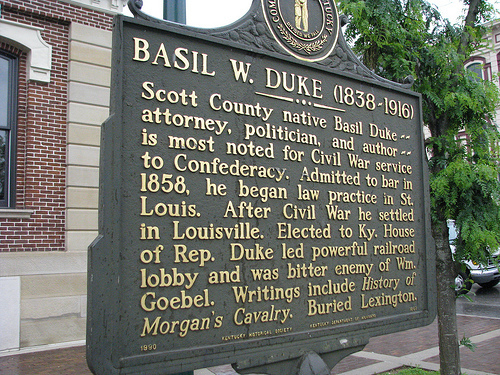 One of this chief rivals was Basil Duke - a Confederate veteran who had served in General Morgan's cavalry and railroad executive of the L&N Railroad. After a number of negative experiences, Goebel pulled himself up through handwork and self-made connections to develop his own political machine. It was during Goebel's rise to power that other Kentucky political machines, chiefly Boss Klair, got their first taste of politics. 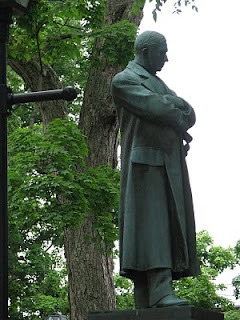 Statue of William Goebel - Frankfort, Ky. Murder, proverbial backstabbing, back-room deals, and some of the most corrupt political acts imaginable (our current legislators might even shudder at what Goebel pulled) create the background that led to Goebel's infamous (though largely forgotten) assassination that occurred just steps from the state capital in Frankfort. Using the Goebel biography written by James C. Klotter as a factual spring board, McEwen weaves a well-written and marvelous background to a dramatic time in Kentucky. Without further research, it is difficult to know where fact ends and McEwen's fiction begins (making me want to read Klotter's book soon!). Goebel was, without a doubt, power hungry and got great satisfaction from any power he acquired. Quite focused, he is portrayed to have not given way to the normal temptations of political life. But perhaps the greatest accomplishment in McEwen's work is his portrayal of the assassin. Although history does not give us his identity, we assume the "mountain man" came and disappeared from the hills of eastern Kentucky. McEwen creates an accounting of this unnamed person, as well. In each chapter, the sad tale of the mountain man - also one of wrath - brings the two toward an inevitable collision in 1900.